Why is no one talking about Picross 3D: Round 2? To put it another way, what can I say about Picross 3D: Round 2? It is an ideal game. It’s not perfect; I could list flaws like the error-prone controls if I were ever inclined to write a review. But as someone who likes to write about games as works of art and craft, it’s almost too ideal to grasp. Like the smooth carved-wood toys you produce when solving puzzles in the game, there are no hard corners or rough spots to get a rhetorical grip on. The game just follows. It follows from its ruleset and its heritage and the decisions made in its design are all either necessary or arbitrary. The decisions are hard to even notice and games like these receive less attention in the critical space due to this invisible design. P3DR2 is the latest in over 10 Picross games for Nintendo systems: an implementation of the well-established nonogram puzzle type mostly for portable devices. It uses a modification of the standard nonogram rules: it’s on a 3D instead of 2D grid, it uses two colors, and instead of listing the exact groupings and order of color in each row it just lists the total number of blocks of each color and whether they are in one, two, or many groups. These are all incremental changes, made to enable the experience required for the game. Consider the groupings. While 10×10 or larger grids are common in 2D Picross games, the foreshortening required for 3D makes a 10-block cube the near maximum size that still allows accurate selection of blocks with a stylus. However, a 10×10 puzzle feels easy in standard Picross; 20×20 puzzles or larger are the norm for advanced levels of 2D games. To make the smaller puzzle size challenging, information needed to be removed. The simpler row labeling is necessary for the smaller puzzle size, which is necessary due to the realities of 3D projection. There’s a division in nonogram games: what do you do when the player makes a mistake? Some games, such as Pokémon Picross, leave the mistake on the board and let you realize your error later when numbers don’t match up. P3DR2 takes the other approach; as soon as you mark a block (orange, blue, or empty) incorrectly, you are told it’s wrong and receive a “strike” which reduces your score at the end of the level. This also follows from the game’s initial design: the process of tracking down a past mistake is onerous enough in 2D that I usually just restart the level. It would be even worse in 3D, where you can rarely see the whole puzzle at once. Additionally, P3DR2 entirely removes blocks that are marked as empty, and restoring ones removed by mistake would add a new, complicated user interface layer that would only actually be relevant when the player messes up. Using the strike approach instead simplifies the interface and avoids confusing backtracking. One design decision in the game is confusing at first glance. In a game series called Picross 3D, in which 3D reasoning is important, on a game device with a 3D screen, why is the puzzle not displayed on the 3D screen? Simple: for whatever reason1, the touch-sensitive screen is not 3D. The designers had to choose between the visual flash of working on the puzzle in 3D and the ease-of-use of selecting blocks with a stylus rather than some awkward directional-pad setup. They chose comfort over style, settling for sliding the puzzle up onto the 3D screen when completed as a sort of reward. What seems an odd choice emerges naturally from the constraints inherent in the game and its platform. Other decisions in P3DR2 seem much less automatic. 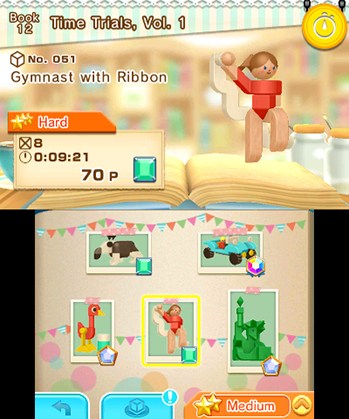 Adding an aesthetic layer on top of the bare rules is common for puzzle games: in this game, the menus have a backdrop of some sort of coffee shop populated by the wooden toys that appear when you solve puzzles. You select puzzles from scrapbooks on the shelves of the shop which gradually become filled with instant photos of the toys. The intellectual, relaxed tone of the environment matches the cerebral feeling of solving puzzles, but one could just as easily set the game in a woodcarving workshop or art gallery. 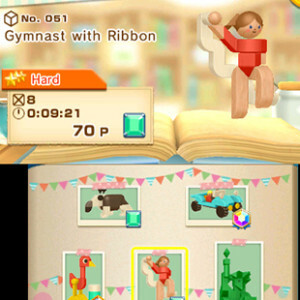 In fact, the game’s predecessor Picross 3D lacked such a menu metaphor, just setting the game in abstract menus. The aesthetics chosen for P3DR2 are appropriate but not particularly notable. They are inoffensive, attractive, and ultimately irrelevant. One could imagine a more inspired or idiosyncratic choice, letting the game explore some other theme or genre.2 But, ultimately, there’s no reason to do so. This scenery is fine. The game also assigns different roles to the different colors of blocks. Blue blocks become solid cubes in the final toy, while orange blocks become differently-shaped pieces: spheres, curves, angles, or posts. Together these compose each more complex shape for the final toy. While this is a clever distinction and continues the series’s tradition of making each puzzle result in a (sometimes) surprising piece of art, it’s also an arbitrary choice. One could just have easily made the two colors represent different materials in the final piece, or represent light and dark or warm and cold colors, or any number of other things. This decision is perfectly good, but it’s neither inspired nor surprising. Why do we not see many thinkpieces exploring the design of Picross 3D: Round 2, a game from the wildly popular developer HAL Laboratory and superstar publisher Nintendo? Why is broad critical discussion mostly restricted to adventure puzzle games like The Witness while fabulous works like Snakebird and Stephen’s Sausage Roll seem virtually ignored? Why is it so hard for me to write about Picross 3D: Round 2? There was a game studies debate, long ago, between academics who supported “ludology” and those who supported “narratology.” Ludologists said that aesthetics may provide a welcoming introduction to a game, but what is really important are the rules and the experience of playing. Narratologists said that games are really just a way to explore a story, and the rules exist only to serve that end. Of course the consensus settled out in a middle ground where both perspectives are interesting. Still, our discussions about games are flavored by these perspectives: we like talking about the novel experiences a game gives us and the interesting stories the game enables. Industrial design is a discipline that was, until recently, entirely ignored by society at large. Until the arrival of things like the film Helvetica, the rise of Apple fandom, and the podcast 99% Invisible, we didn’t think about the fact that someone spent hours and hours designing the chairs we sit in (and many folks still don’t think about it). Chairs are functional. Their design aspects are either necessary (they must be built in such a way that they support weight) or they are arbitrary (they should look nice but seldom make a loud artistic statement outside the most avant-garde design studios). I probably play P3DR2 more than any other game right now, and have for weeks. My 3DS often sits in my bathroom, and I try to stay well-hydrated. Many nights recently have ended with me on my couch, spending a far-too-late half-hour finishing just one more puzzle. And yet the only ludological hook I can think of is a small discussion of why the game divides group counts into “one,” “two,” and “many.” The only narratological story I can tell is of the unsettling sight of the inside of Gulliver’s skull during a multi-piece construction puzzle. This is a functional game. It does what it sets out to do and it does it exceedingly well. It is lovely and well-polished and near-seamless and that should be enough to have people talking about it. But what would they say? This article was made possible in part through the Patreon donation program. To support my work, sign up for my Patreon and help me continue producing writing like this.